This year was the 16th Annual Dragon Con Parade, the eighth one I've seen, and it was again totally AWESOME! 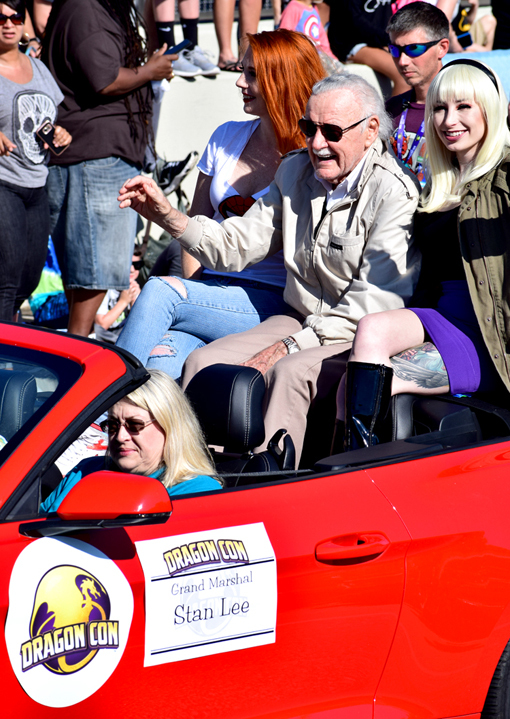 The Grand Marshall of this year's highly attended parade was Stan Lee, the man behind hundreds of Marvel superheroes. I grew up with Iron Man, the X-Men, The Incredible Hulk, The Fantastic Four and so many more. It's totally awesome to get to see Stan Lee, AND to see so many cosplayers showing their fandom for superheroes, like Spider-Man. There's of course something for everyone! 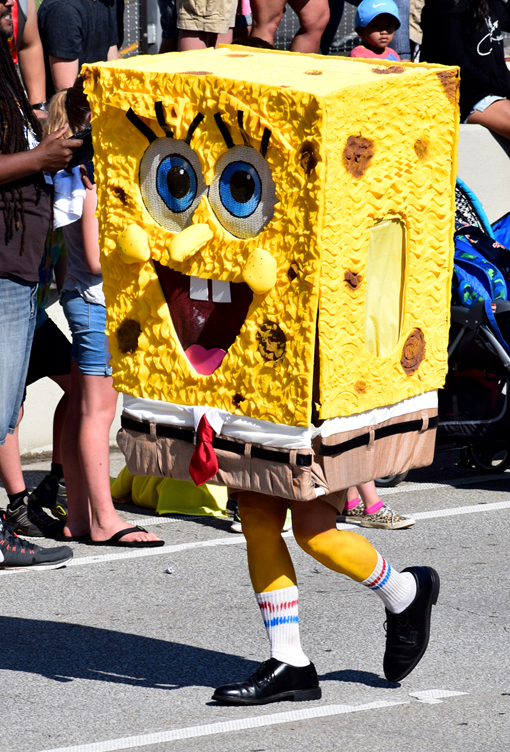 The Dragon Con Parade covers a multitude of genres, including television cartoon personalities, such as SpongeBob SquarePants. The kids love him and many in the audience who are now adults love him, too! 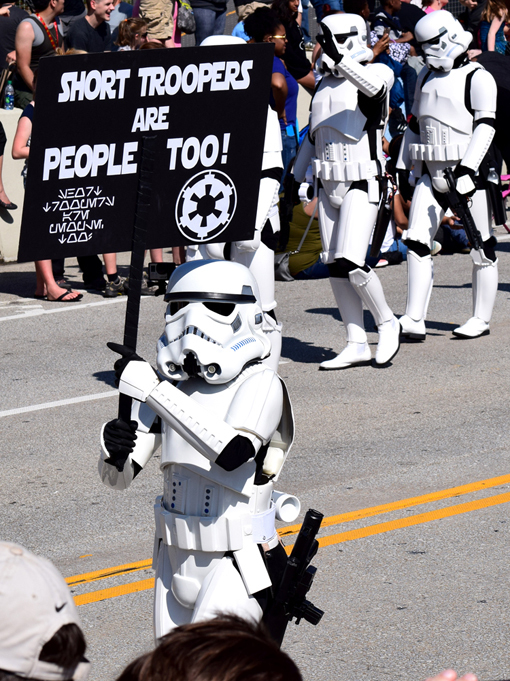 The Dragon Con Parade isn't just for kids, though. It's for all ages of pop culture fandom! It's true that the convention itself draws primarily young adults/young professionals, but there are still quite a few conventioneers on the other ends of the age spectrum. 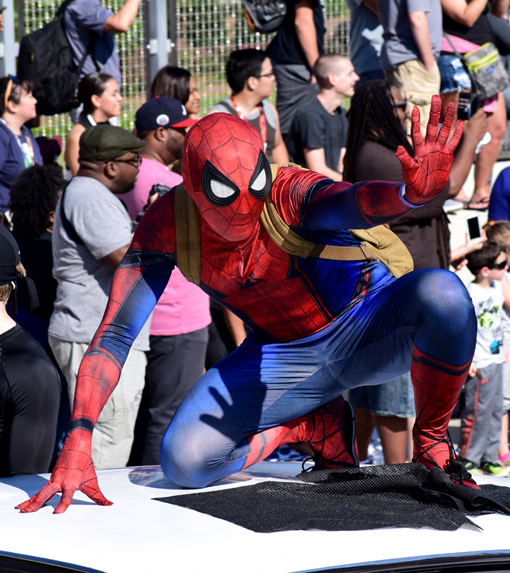 The Parade is a free, open-to-the-public Dragon Con event, so many, many more youngsters come to Downtown Atlanta's Peachtree Street to join in on the fun. Some superheroes have been superheroes for generations. 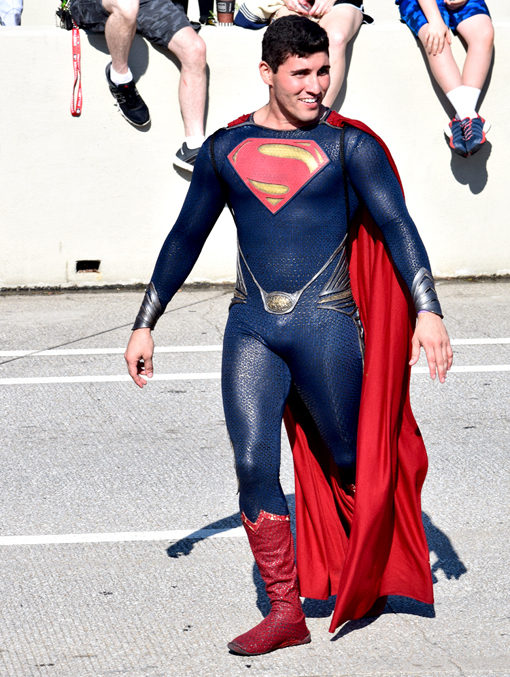 Superman first came on the scene in 1938 and Dragon Con has a great many Superman cosplayers, some quite convincing! 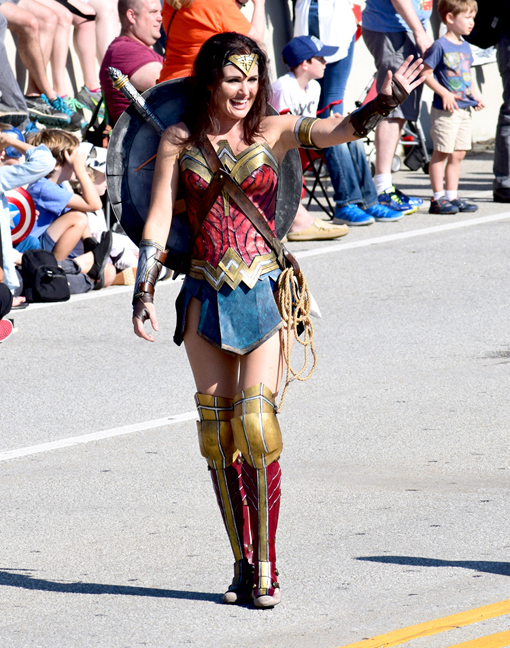 Without fail, we see cosplay upticks just before and immediately following a major motion picture, in this case, the 2017 WONDER WOMAN movie...which is AWESOME! The Spartans of the Dragon Con 300 cosplay group are always a big hit. 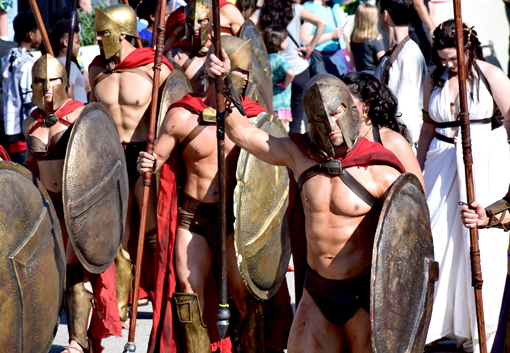 They're inspired by the 2006 film "300", starring Gerard Butler. I've said it before and I'll say it again...I love clever! 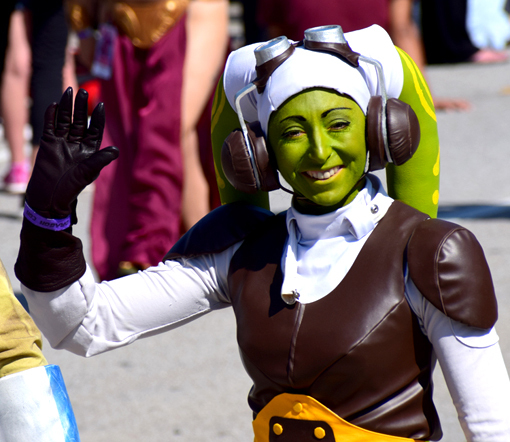 This cosplayer totally reminded me of the line delivered by Princess Leia when Luke and Han go to rescue her. When Luke broke into her cell, the first thing she said, quite calmly, "Aren't you a little short for a Stormtrooper?" This trooper is totally awesome! My celebrity-spotting hobby (not stalking, that's quite different) began in 2002 when I met Leonard Nimoy at the National Press Club in Washington, D.C. That experience changed me. He was incredibly nice, super funny, and humble. For me, he set the tone for what I thought all celebrities would be like...and I'm grateful that many have been. I didn't get to meet this particular Spock cosplayer, but he's the best I've ever seen! 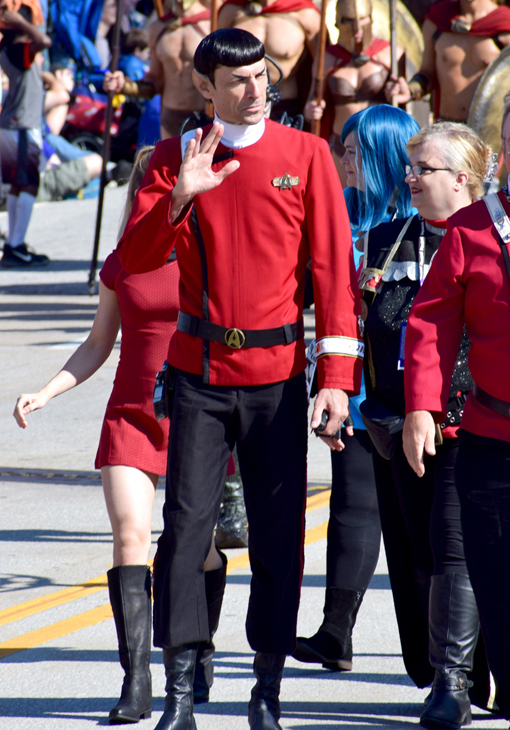 I've cosplayed a Vulcan before, but I wasn't nearly as awesome as this guy is! 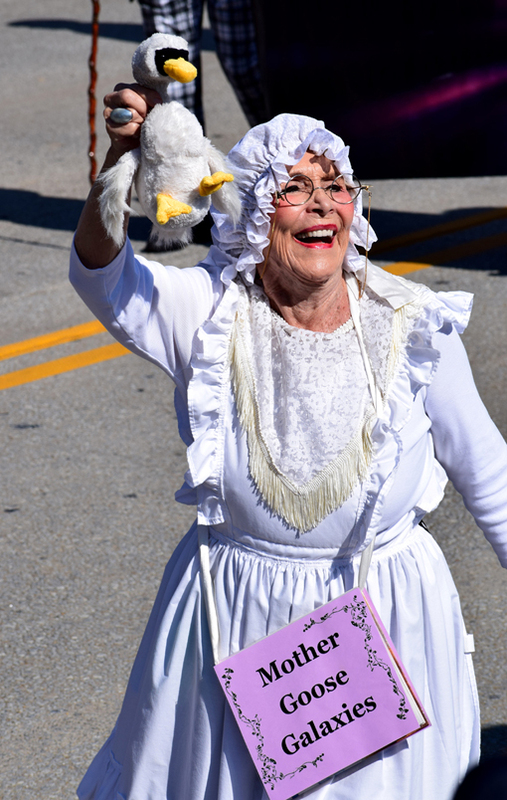 Atlanta's greatest parade, and I believe the largest, draws thousands of people of every size, shape and color. It's one of the most peaceful gatherings of such a diverse group of people. That's one of the many things that I love about this event. I'm amazed every year at just how much goes into the costumes and makeup by the cosplayers. And some of them have equally elaborate costumes for every day of the convention! 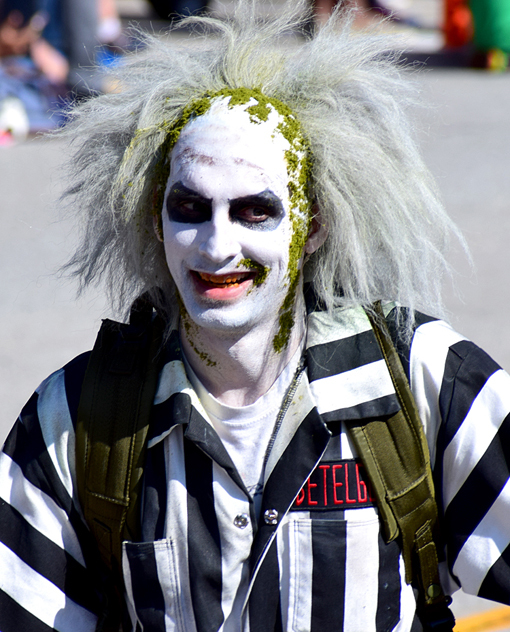 You can say Betelgeuse as many times as you like, but never say Bettlejuice three times in a row or you'll have to deal with this guy! One of the great things about the Dragon Con Parade is that you can totally enjoy it even if you don't know many of the characters represented in the cosplay. It's easy to admire the time and talent that went into an elaborate costume and makeup. "Applause" for everyone who makes this parade as awesome as it is! Dragon Con is much more than a celebration of pop culture. It's also deeply committed to giving back to the community. 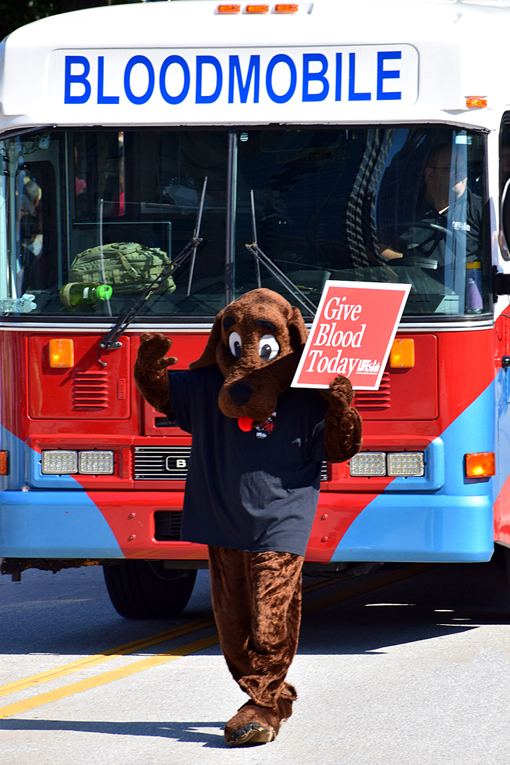 Every year it conducts one of the largest blood drives in the city and there's always at least one other fundraising effort...this year it was for Special Olympics Georgia. I don't know the fundraising numbers yet, but Dragon Con committed to matching the first $100,000 raised. That's super special in my book! Keep your eye on the Dragon Con website and its social media channels for when next year's Dragon Con Parade will be and mark your calendars. See you then!